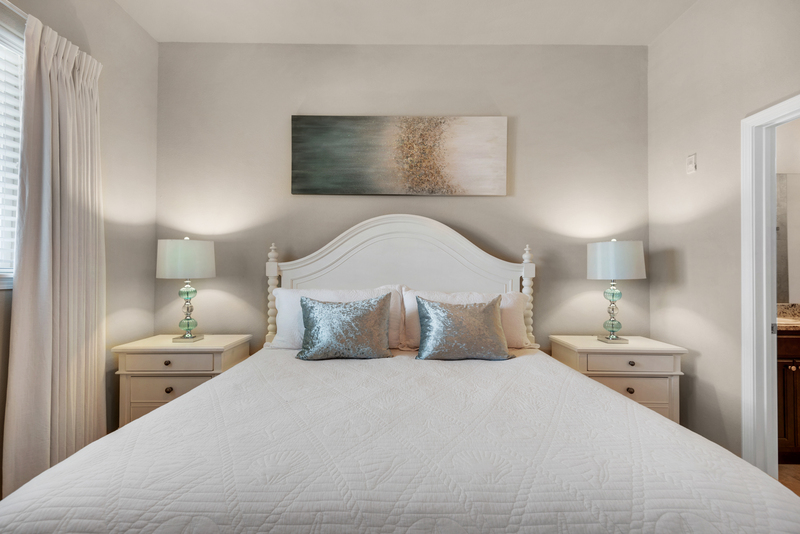 If you are looking for a beautifully furnished, well-appointed condo that offers a private balcony with views of the Gulf of Mexico, and a 2 minute walk to dip your feet in the water, then you have found the perfect vacation getaway! 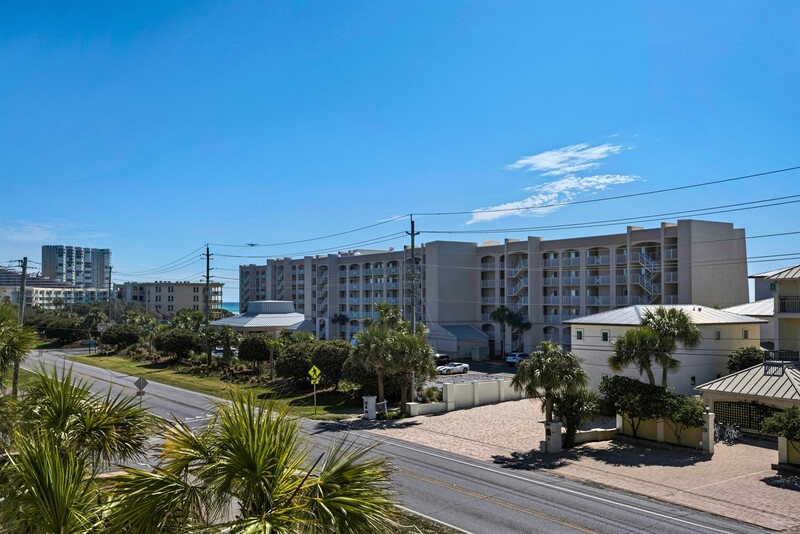 This vacation condo located in Destin offers three spacious bedrooms, two bathrooms and can comfortably accommodate up to nine guests! 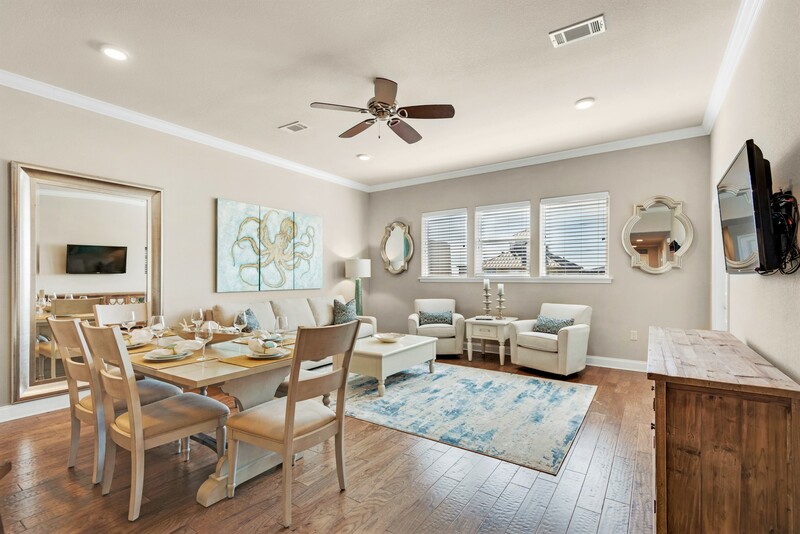 As you enter this stunning condo, the first thing you notice is the beautiful natural light of the Florida sun that radiates throughout the space. 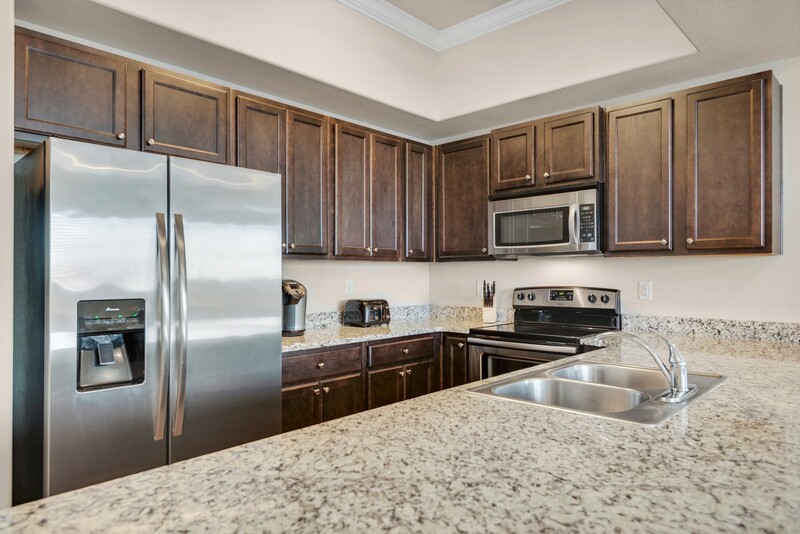 A full kitchen featuring stainless steel appliances and granite counter tops provides a great space to prepare a picnic lunch for a fun day at the beach. 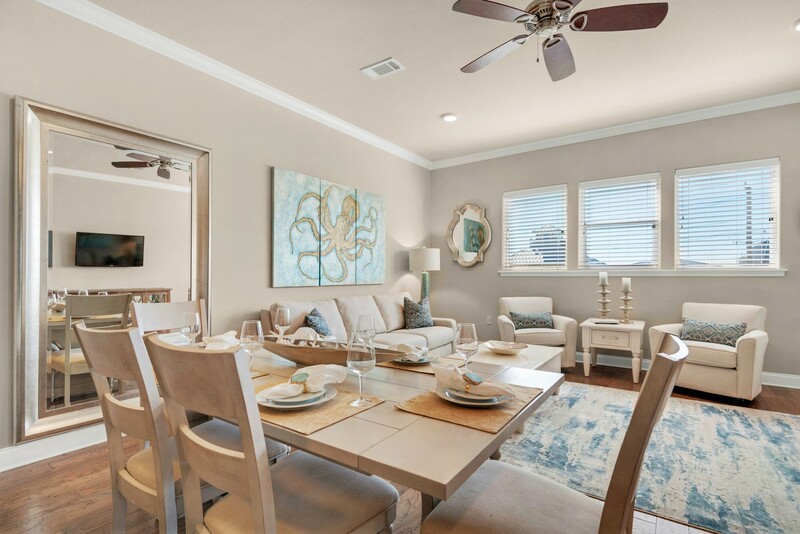 The beautifully decorated dining area and living room lead to a private balcony that offers incredible views of the community and sparkling blue/green waters of the Gulf. 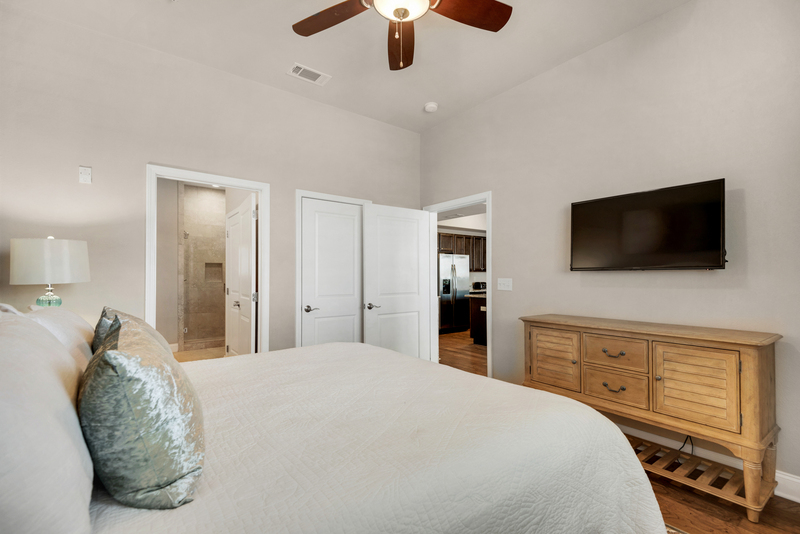 The master bedroom features a luxurious king size bed, perfect for relaxing after a day at the beach. 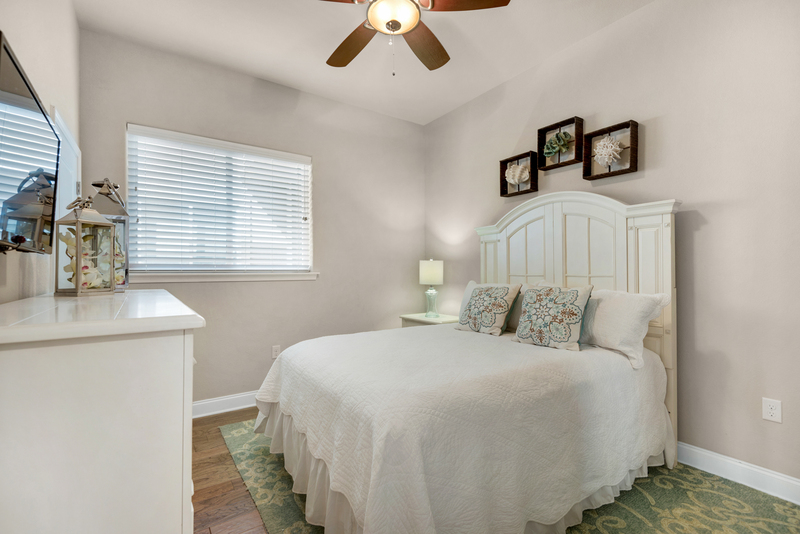 The additional two bedrooms are both spacious and welcoming. 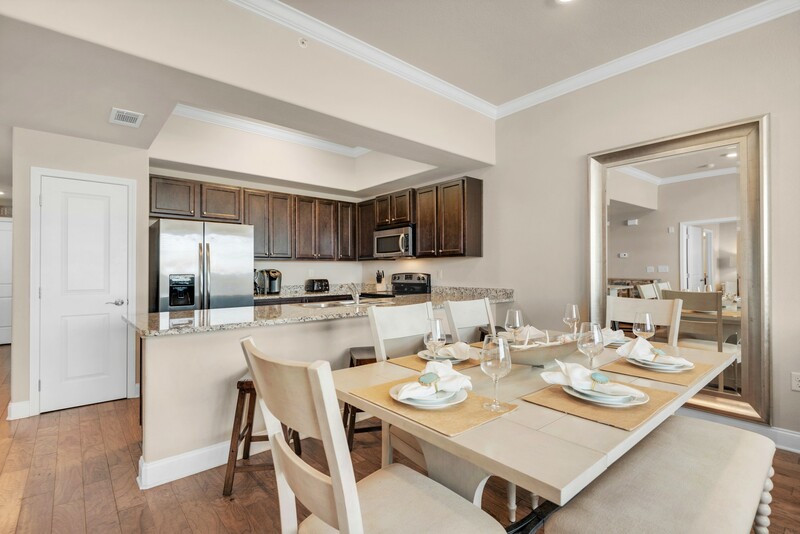 With more than enough room for nine guests, Alerio, unit C304 is perfect for your next vacation to the Emerald Coast! 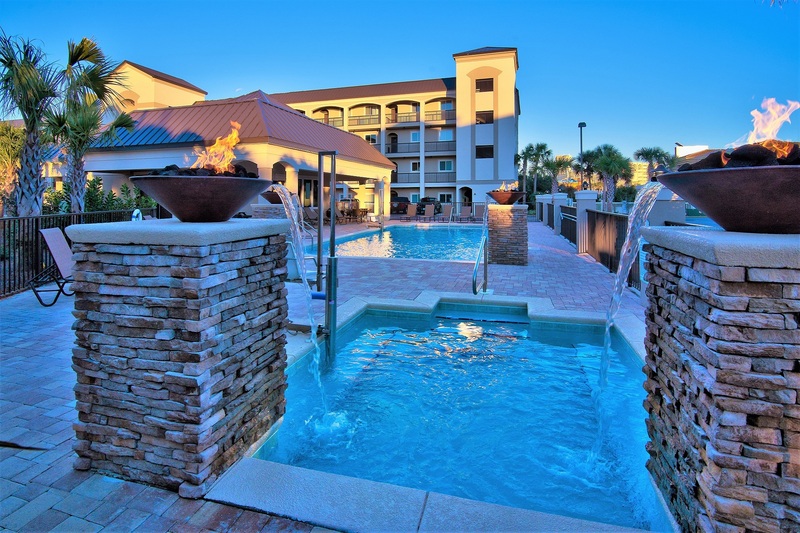 Alerio is a wonderful resort that offers many amenities, including a community pool, a splash pad for kids, community hot tub, barbecue grills, picnic area, and so much more. 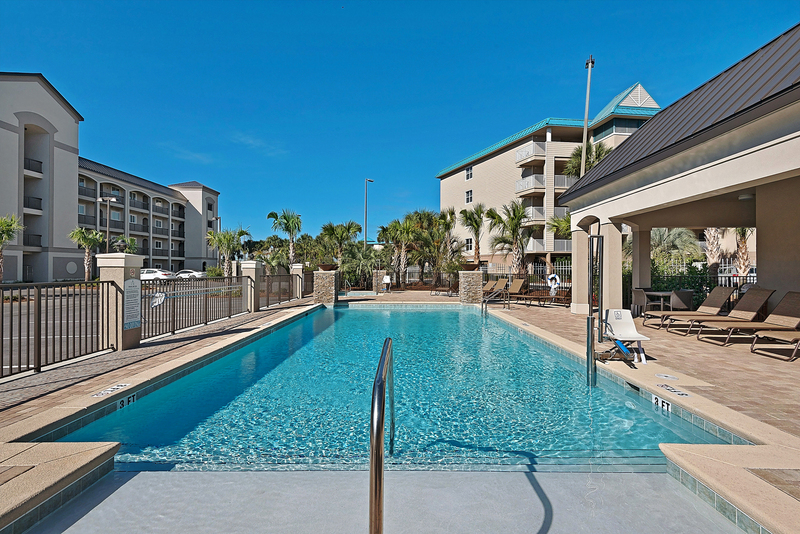 Spend your days relaxing by the pool at the resort or go on a beach adventure by exploring Destin. 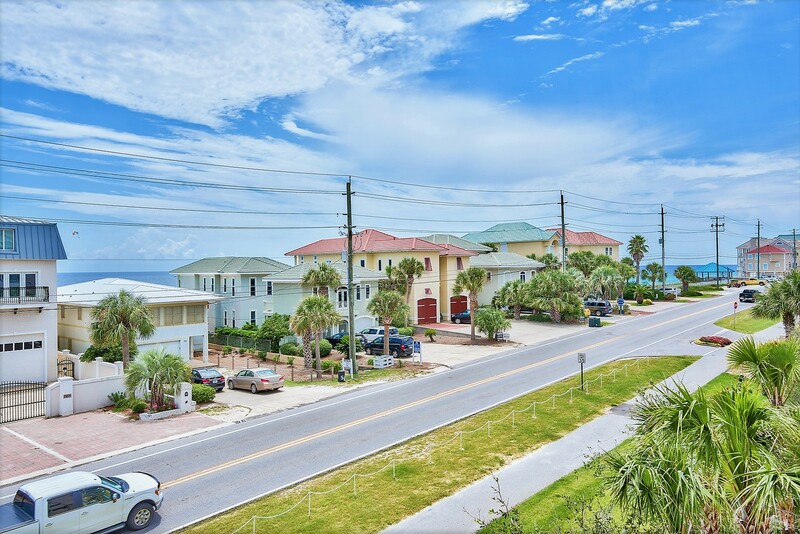 Alerio is located conveniently close to many local attractions, so you can easily enjoy a day on the sparkling waters of the Gulf of Mexico parasailing, riding jet-skis, and more! 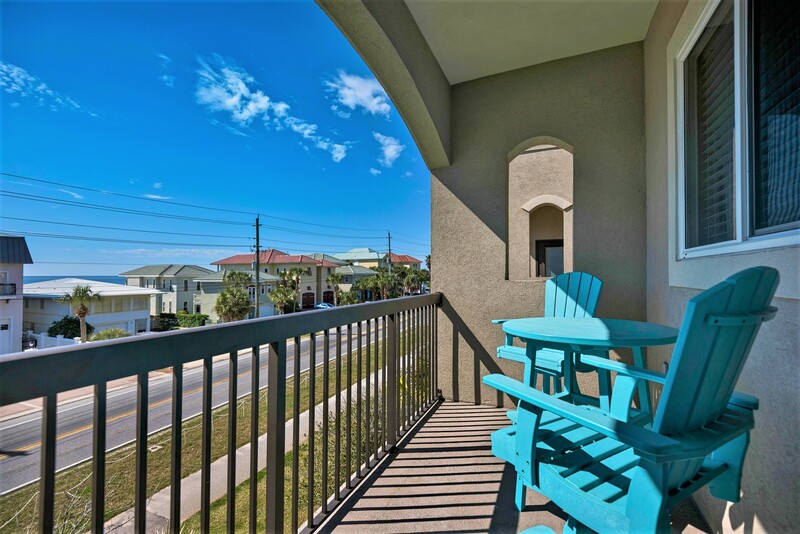 Perfect condo across the street from the beach! "My husband and I brought our 2 year old daughter to stay here and we couldn’t have asked for a better experience. WE WILL DEFINITELY BE BACK! Once we arrived we didn’t really need to drive anywhere, as the beach access was a quick walk across the street, Alvin’s Island was a block away where my husband was able to pick up swim trunks since he forgot his at home, and our newly found favorite restaurant Surf Hut is also just a block and a half away. I highly recommend Surf Hut as they have ocean front dining with amazing food, yummy drinks, and fun games you can play in the sand. 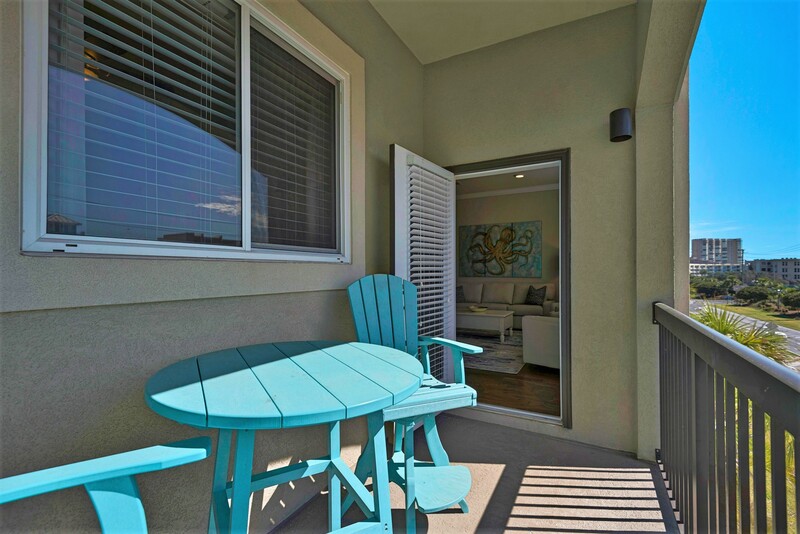 There are actually two beach access points for this condo, one of which is a covered pergola type of structure that overlooks the water and is a great place to have a picnic lunch. Taking our 2 year old fish of a daughter swimming was easy as pie too, the pool was very kid friendly and we spent a lot of time out there letting her wear herself out. The condo provided beach and water toys that came in very handy to occupy the little one. 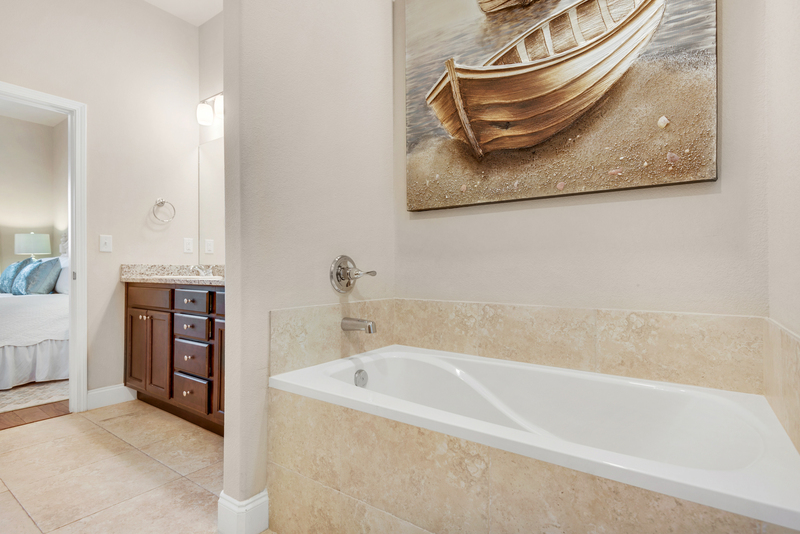 Aside for the amazing location and family friendly atmosphere, this condo was BEAUTIFUL!! The furnishings looked brand new, very welcoming, and the living room furniture as well as the beds were extraordinarily comfortable. Our daughter stayed in the “kid” room that had a TV for her to watch her cartoons and was decorated with the cutest elephant décor and salt lamp nightlight. 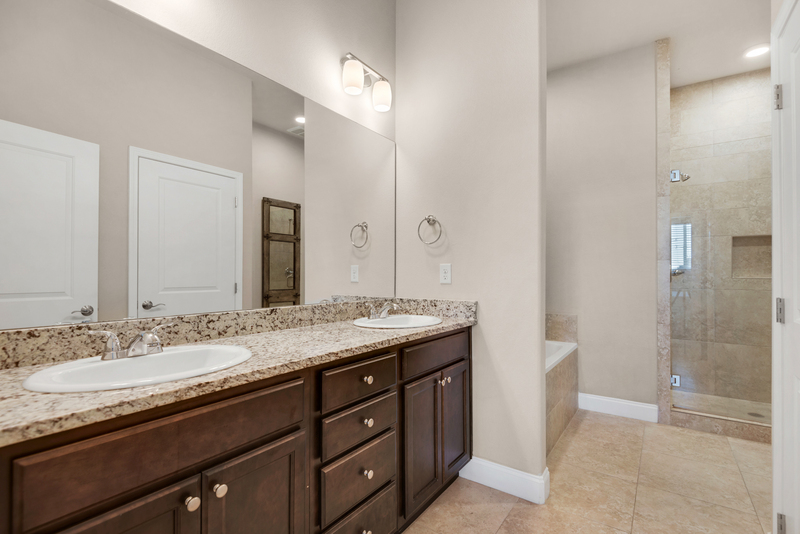 There was a spacious bathroom right next to her bedroom that was the perfect size for taking the sand off and cleaning up at night. 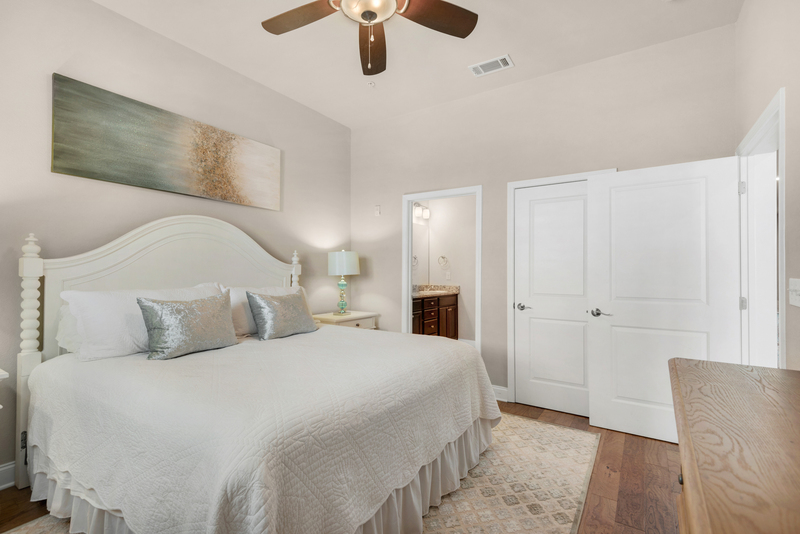 The master felt like paradise with beautiful beachy glamourous décor and a very large master bath with double sinks, separate shower/bath, and even its own toilet room. We opened the windows at night and you could hear the waves crashing, it was so peaceful. 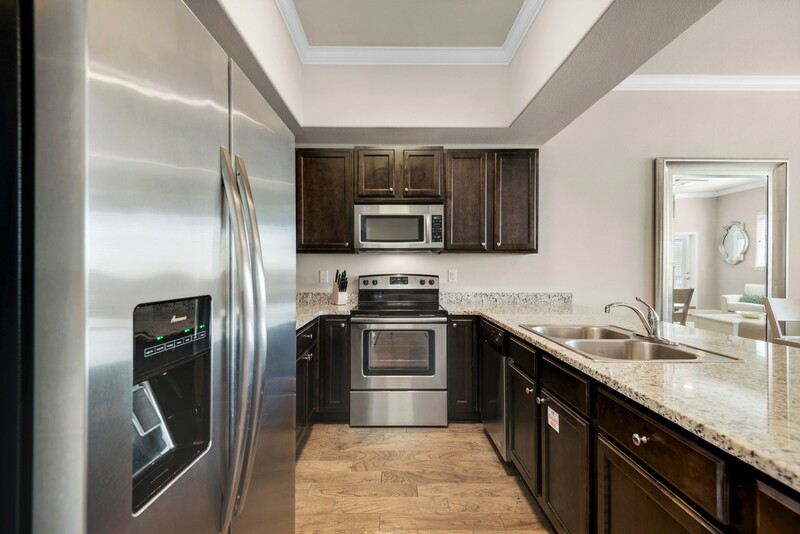 The kitchen felt like home with nice new cabinets and granite and easily saved us some money being so well stocked to make a home cooked meal. 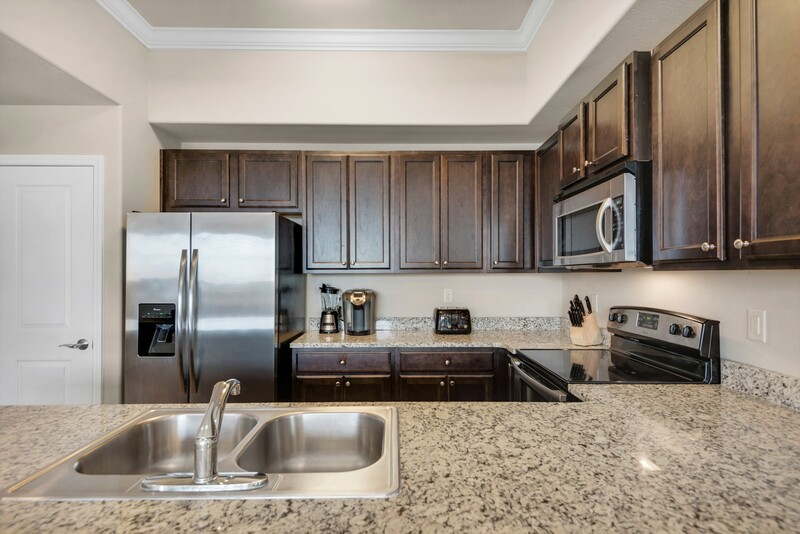 We have been visiting the emerald coast for years and we are very impressed with this condo and location. We plan to come back and make more memories! " Thank you so much for your review of the condo. We are so glad you enjoyed your stay in Alerio C304. Destin Palms is proud to represent these owners as their management company. We appreciate your business and hope you will return to book with us again. "This was the first time we had Christmas away from home, yet we couldn't have felt more at home! This place had more than enough room for our group, was impeccably clean, and perfectly located. We spent Christmas swimming in the pool and cooking our dinner in the kitchen, which had everything we needed. Hoping to come back again next Christmas!" "Thank you Rebecca! We sincerely appreciate you taking the time to share your review and are delighted that you had a memorable stay at our condo in Alerio. 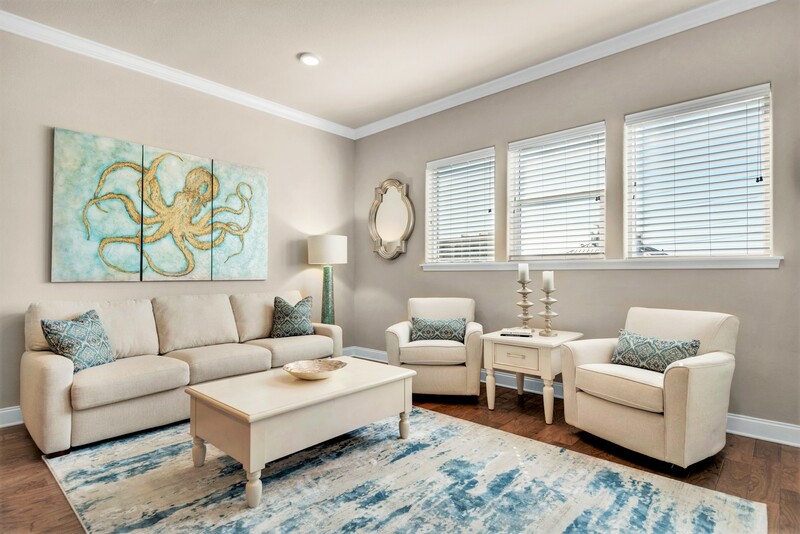 Next time you need some relaxation here on the Gulf Coast, we hope you consider Destin Palms Vacations again to take care of you and your family! Sincerely, Destin Palms Management"
Parking can be a little bit of a hassle on holiday weekends but still good overall. Lots of cookware if you want to dine in. I definitely want to come back"
"Thank you for your feedback Allen! It is great to hear that you and your family had a great experience and enjoyed the condo you rented from us here at Alerio. You all were certainly a pleasure to host and we look forward to welcoming you to stay again soon! 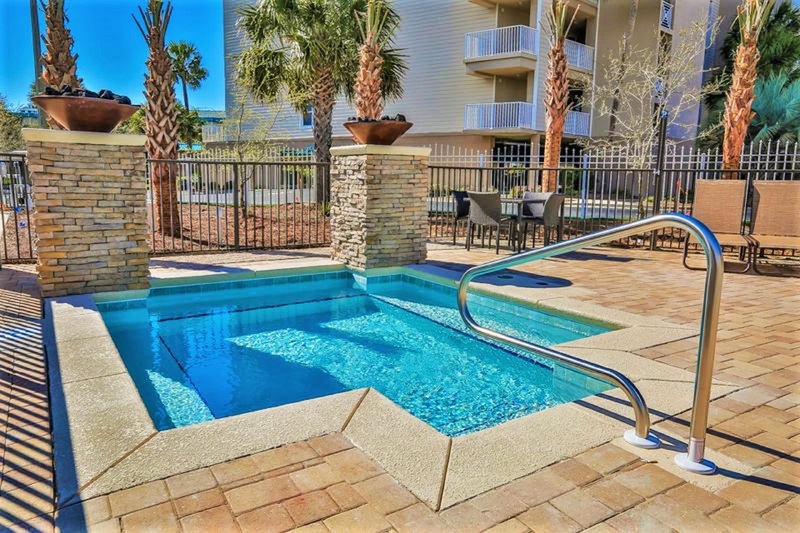 Best Regards, Destin Palms Management"
"Our condo was awesome. Very clean, well stocked with cooking supplies, good location. Close to grocery store and restaurants. The beach was just a short walk across the street." "Thank you for your positive review! We are glad you enjoyed your stay, and we look forward to your next stay with us. 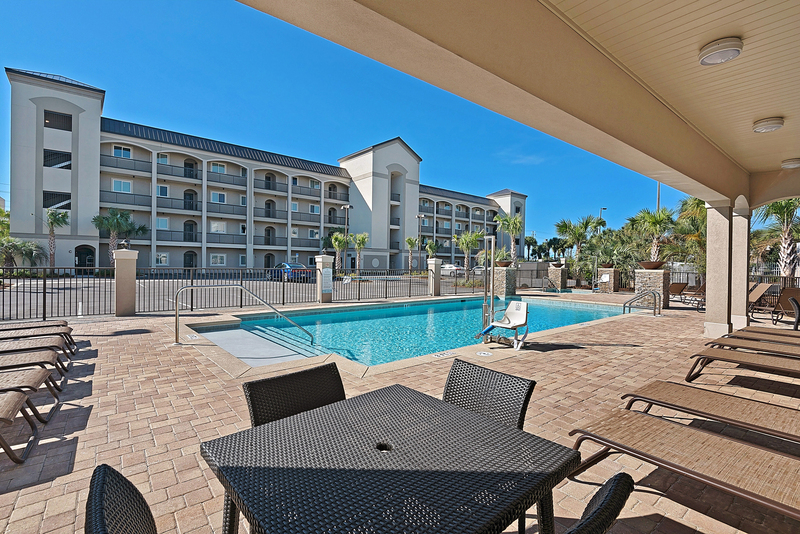 :) Best regards, Destin Palms Management"
" Definitely looking at re-booking for next year. The place is Super clean, beautifully decorated with a beachy feel, and all within a short walk to the beach. 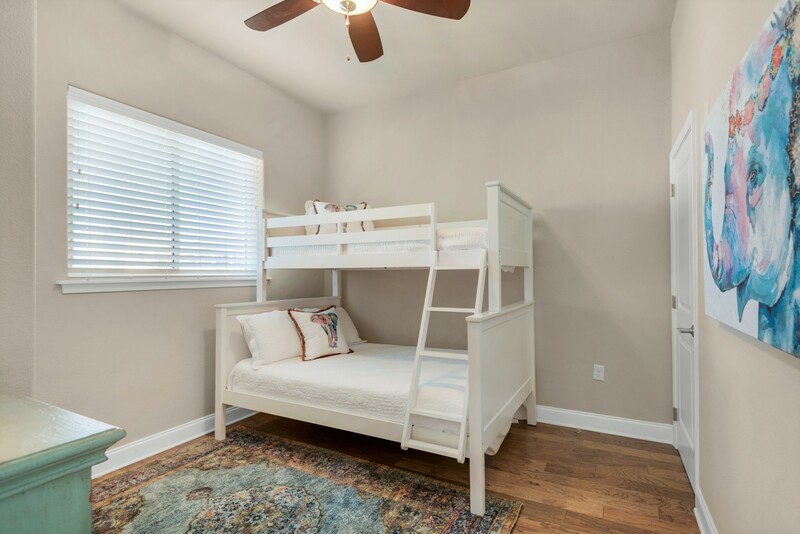 My 11 yo daughter loved the location ( as it is also right next-door to Alvins island for shopping 😉 and loved the bunk beds) the master suite was extremely comfortable with a luxurious bathroom. " "Thank you Katy for such wonderful feedback. 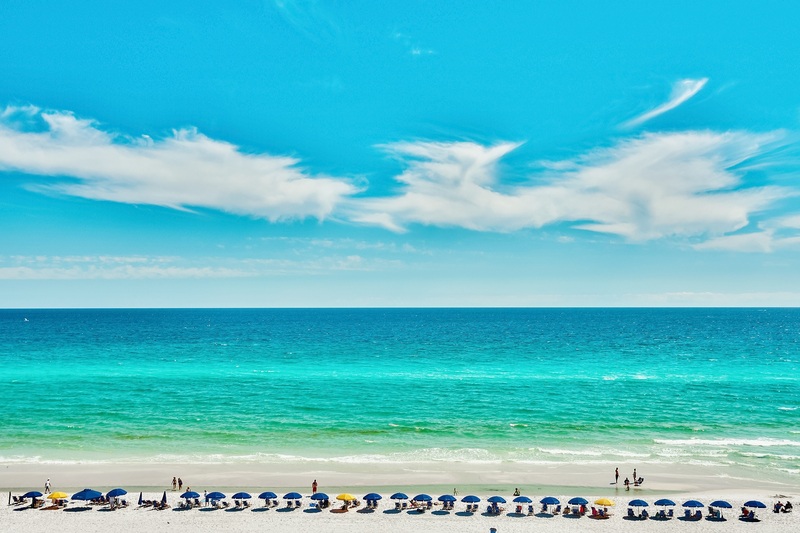 Here at Destin Palms Vacations we strive to help our guest experience the very best of the Emerald Coast. We look forward to seeing you next year! See you at the beach! 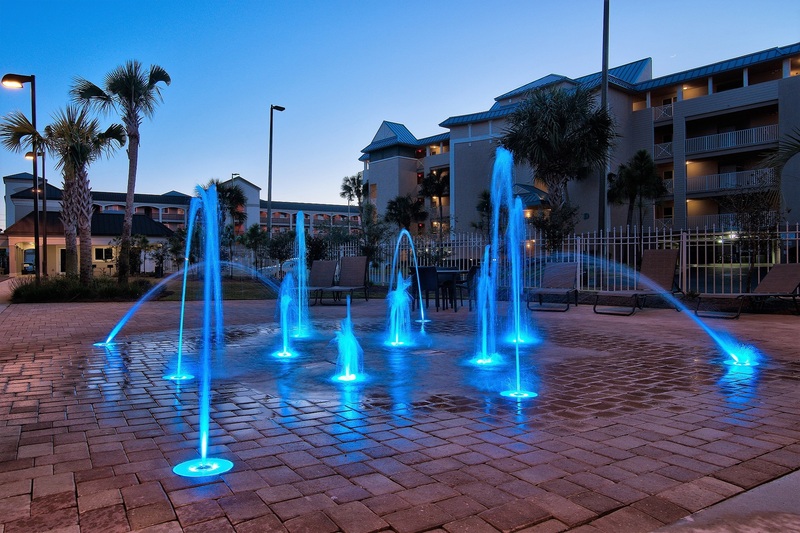 Destin Palms Management"
"Beautiful...can't say enough great things about this condo! Everything was clean, easy access to beach, close to shopping and within walking distance to restaurants. " "Thank you for your positive review! I apologize for the float did you try talking to them? We are glad you enjoyed your stay, and we look forward to your next stay with us. :) Best regards, Destin Palms Management"
"Our family had an awesome week in a condo that was bigger and nicer than the pictures show. Everything was top notch and our entire family was more than satisfied. We highly recommend it to anyone considering it. There were no surprises." "Thank you for your review James! Always a pleasure to hear that our guests had a great stay. We look forward to having you and your family stay with us here again in the future. Have a great holiday! Sincerely, Destin Palms Management"
"We had a fabulous time in Miramar Beach. 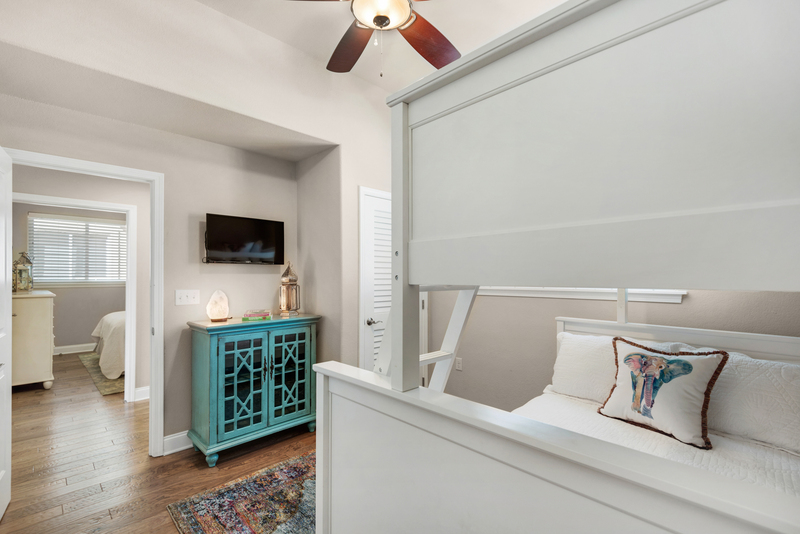 The dÃ©cor was amazing, the unit was comfortable and perfectly located to everywhere we wanted to go. 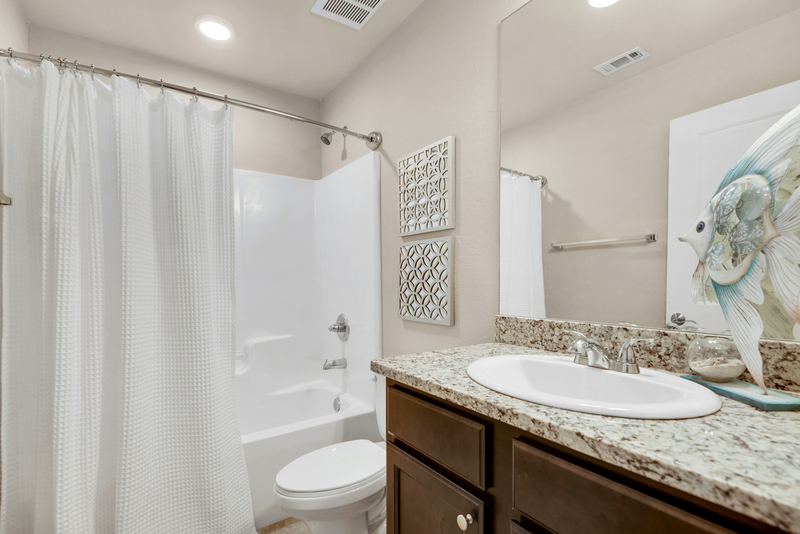 I will highly recommend this unit to my family and friends, and will return!!" "Thank you for your great review! We are so glad you and your daughter and an amazing time!! We look forward to your next stay with us. 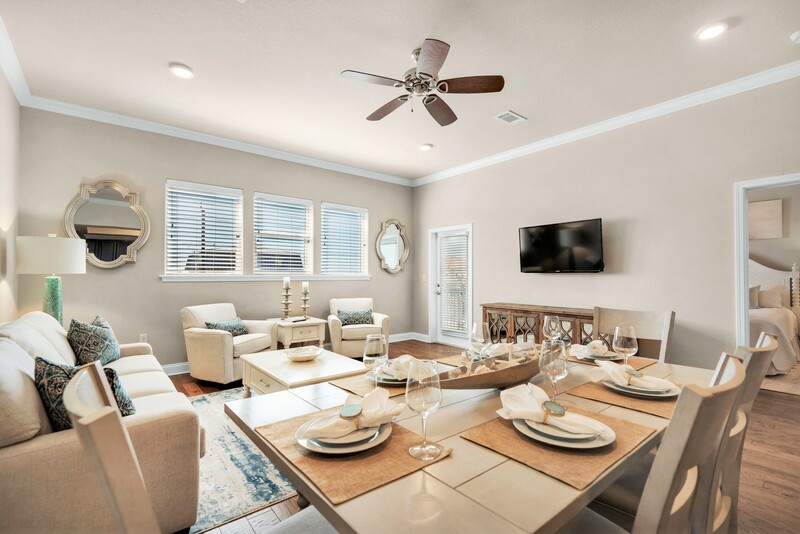 :) Best regards, Destin Palms Management"
"When I first walked in the living room and kitchen were the first rooms I saw. The living room was spacious and the decor was AMAZING! It wasnt like walking into a small hotel with the typical bed and dresser. The decor made it feel like I was at home. 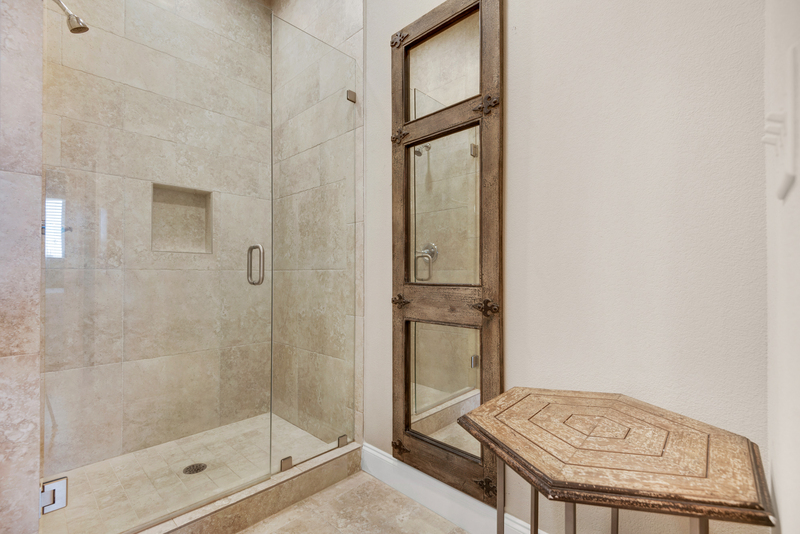 The master bathroom was gorgeous. The tub was very deep and oh so relaxing. Im 8 months pregnant and it came in handy at the end of the day when I needed to relax and soak my swollen feet and ankles. The other two rooms were just as lovely and spacious. It was extremely helpful that each room had a closet. 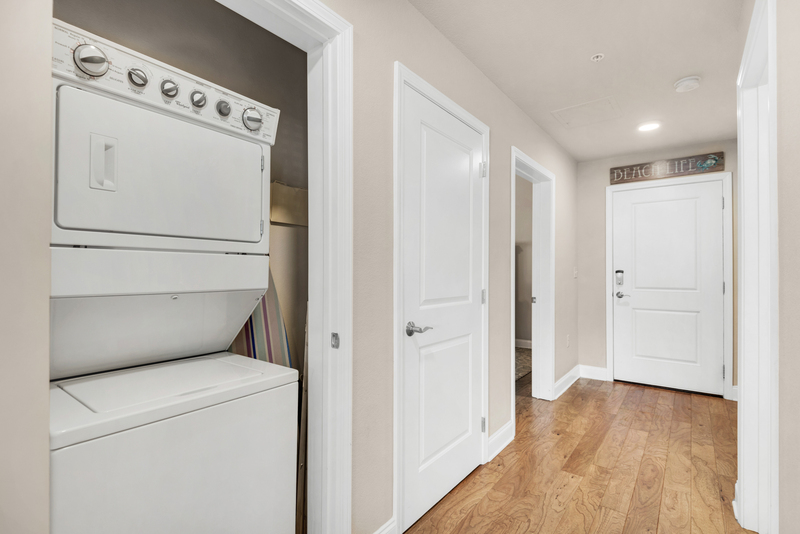 Did I mention there was a washer and dryer too? We never ran out of towels becuase we just threw them in the washer every night. The kitchen is fully stocked all you need to do is buy the food to cook. I WILL BE BACK! " "Thank you for the feedback. Happy to hear you had a great stay iat Alerio and hope you will return with a new bundle of joy later this year. 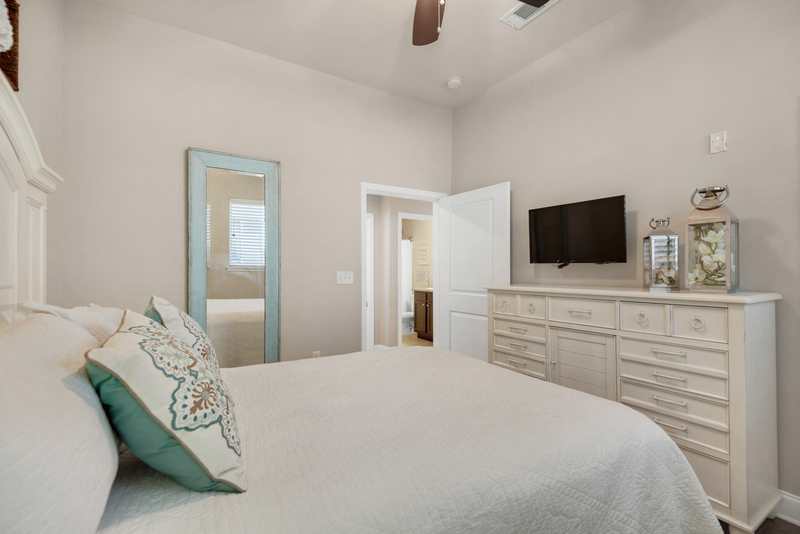 Destin Palms Management "
"The condo was decorated beautifully and everything looked brand new. The kitchen was very well equipped even down to a waffle maker. It was noisy though. We could hear the people above us walking around. Building C is right on the road so the master bedroom has a lot of road noise. 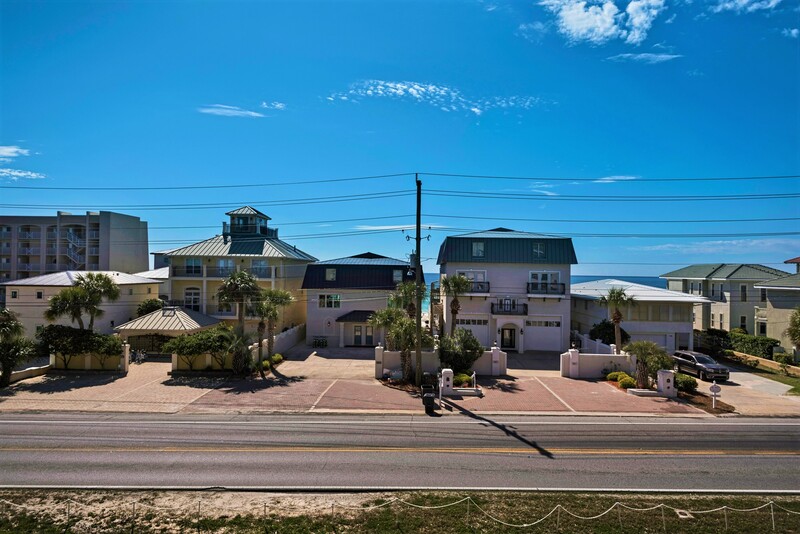 Access to the beach is convenient with a public beach access right across the street from the condo. The pool was fairly small for such a large development. It was crowded so we typically had to wait to find 3 places for our adults to sit. Some people brought their beach chairs for seating. The pool is located in the middle of the parking lot so cars pull up to the fence a few feet from where you are sitting. Hot tub was nice and large. We rented a 3 bedroom unit that sleeps 9 so we had 2 vehicles with us. You only get one parking pass and there is no designated parking available off property to park so you are on your own to find a place to leave other vehicles. We found a small unpaved lot close to a restaurant where we left one vehicle. It was not a very busy time of year so I'm not sure we would have been so lucky during summer months. " "Thank you so much for your comments. We appreciate all the feedback we get from our guests. The HOA for the complex has gained an agreement with a local business directly next to the building where they now have permission to park additional cars if needed. We apologize for the inconvenience you endured with parking during your stay. 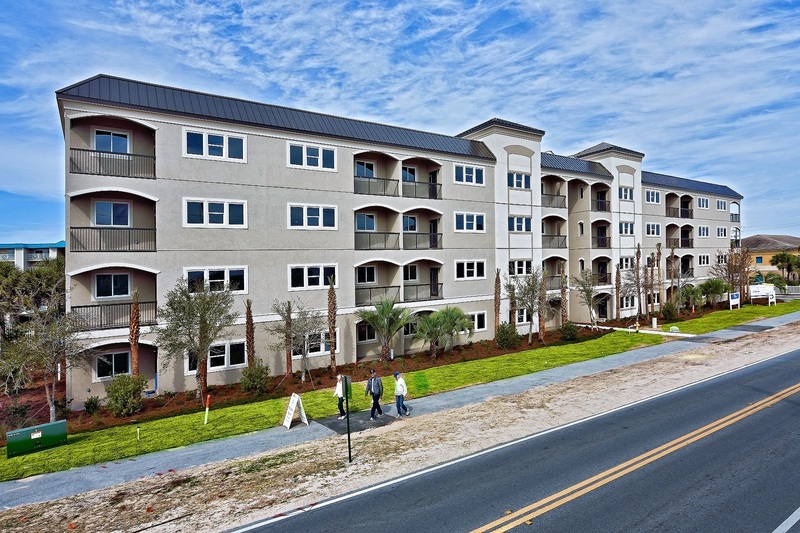 Destin Palms and the owners of Alerio C304 hope to maintain your business and appreciate you as our guests. Sincerely, Destin Palms Management"